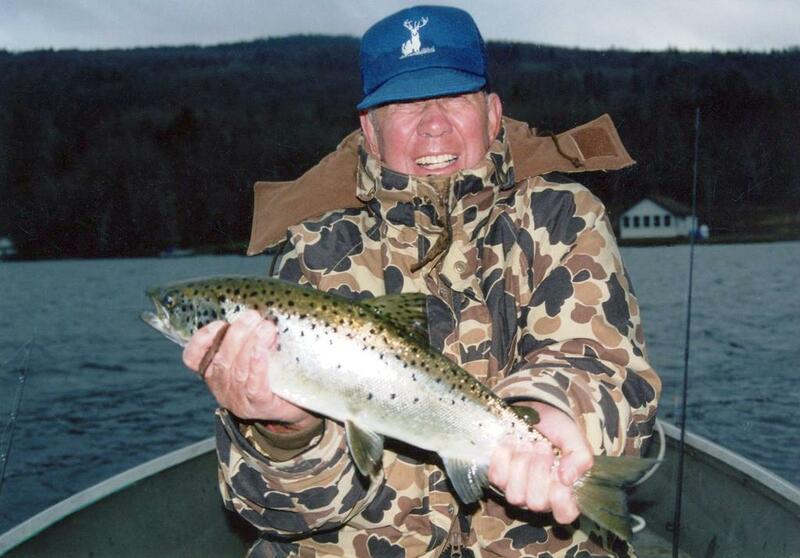 The writer’s late father, Jerry, shows off a lunker ice-out salmon. As the ice continues to recede, area anglers get ready for arguably the most exciting angling of the year; ice-out trolling for salmon. Nothing can compare to the drag-screeching runs a hooked landlock makes after a long, dormant winter. Ferocious beauty could be defined as a salmon doing a tail dance as it tries to throw your lure or fly. Despite the cold water and cold mornings, these fish get our blood pumping. In this region, Sebago Lake is typically the first to shed its icy cloak. For more than a century, this has been the go-to spot for salmon, ever since the world-record landlock was dredged up from the big lake in 1907. Anglers in the know target fish at ice-out for two reasons; the fish are hungry after a long winter and the smelt run up the Songo River draws fish into the river mouth in search of abundant prey. Trolling a sewn-on smelt just off of the buoys and along the northern shoreline of the lake produces, and if you time your angling when the smelt are running, hold on to your rod. There is a lot of history on this lake among salmon anglers. Legendary guides crafted specific trolling flies. Anglers could board a train in Portland and be on the lake after a 16-mile ride. Inns, hotels and even a casino sprang up to handle the influx of anglers, many hailing from out of state. Live smelt are the bait of choice during the smelt run. Old timers would sew their bait onto a single-hook rig. Most modern anglers, this one included, prefer to use a sliding bait harness that adjusts to fit the size of your bait and allows you to fine-tune the way the smelt runs. Most anglers use a fly rod and reel with sinking line, followed by 30- to 40-feet of monofilament line. The fish are up close to the surface at ice-out, so fly line is all you need. Besides, a 3- or 4-pound salmon on a fly rod is quite a rush. When the wind picks up and it becomes hard to troll bait, most of us will switch to streamer flies and troll them at a faster pace. Jigging the rod back and forth imparts life to the fly and makes it appear to swim and flee from prey. When the big lake really blows, that spells the end of the morning fishing and perhaps a nap back at camp until the afternoon. Two area guides crafted what are perhaps two of the region’s top-producing streamer flies. In the 1920s, C. Lowell Barnes ran Jordan’s Store and took anglers out on the big lake, rowing for miles, trolling bait or flies. His Barnes Special, resembling a small yellow perch, is a phenomenal producer and usually one of the first flies I tie on each season. Later on, renowned guide Art Libby created his Miss Sharon fly. Libby guided on the big lake out of a converted lobster boat and was known to spray WD-40 on his arthritic knees for relief. Last year, anglers reported good catches of salmon and lake trout at ice-out with smelt and flies. Other anglers did well with lures, such as the DB Smelt, Mooselook Wobbler and Carlson’s Trolling Spoons. Get out there soon, the smelt run comes fast and is over before you know it. Up next month, trout come on the bite. Tom Roth is a freelance outdoor writer who lives in Raymond on the shore of Sebago Lake and has been fishing and hunting in this region for more than 30 years.